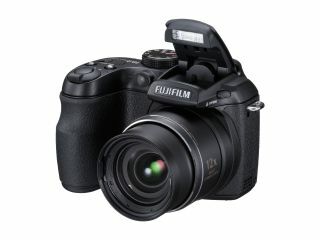 Fujifilm has just revealed its latest camera for those at the higher-end of the amateur photography scale – the FinePix S1500. Described by the company as a "compact, extremely lightweight digital camera" the 10MP S1500 packs an impressive 12x optical zoom lens (33mm-396mm equivalent) and Dual Image Stabilisation. ISO levels are decent too, up to ISO 6400 – great if you find yourself shooting in the gloomiest of situations. While the S1500 looks like an SLR, it's not one. It does house some SLR-like features, however, including a Quick Burst mode which shoots at 7.5 frames per second at 2MP. There's a 2.7-inch LCD screen to view your images on and two handy options: High Speed Playback or Micro Thumbnail View. The only thing that really lets the camera down is the fact that it is powered by AA batteries – surely a rechargeable lithium-ion would have been better? Also announced are a slew of compact cameras by Fujifilm. The FinePix J20, Z30 and J250 all employ 10MP sensors, 3x and 5x zoom respectively and are aimed at "consumers who want a stylish camera that's fun and easy to use, but won't blow the budget." The final camera is a waterproof one. The FinePix Z33WP is waterproof up to three metres, for a maximum of two hours and comes with a protective silicon jacket and wrist strap. Release dates and prices are to be announced.